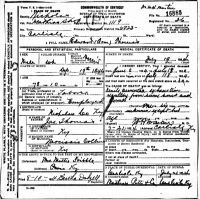 U.S. Census Lower Blue Lick, Nicholas County, KY 1880: "Edward Thomas, age 33 b. Abt. 1847 Kentucky parents b. Kentucky, farmer; wife Annie, age 28 b. Abt. 1852 Kentucky parents b. Kentucky; two children b. Kentucky: Maud 7, Mattie 4." Family Annie B. Barnett, b. Jun 1850, Kentucky, U.S.A.
2. Mattie Thomas, b. Jun 1876, Kentucky, U.S.A.
3. Stella F. Thomas, b. Nov 1882, Kentucky, U.S.A.
+ 4. Charles Mathew Thomas, b. 13 May 1887, Kentucky, U.S.A.
Born - 15 Sep 1845 - Nicholas County, Kentucky, U.S.A.
Died - 19 Jul 1924 - Nicholas County, Kentucky, U.S.A.